Sankari's Sunshine Corner: Taylored Expressions August Sneak Peek: A Classy View and Say What? Taylored Expressions August Sneak Peek: A Classy View and Say What? Guess what tomorrow is over at Taylored Expressions? Its Release Day! But before we jump the gun, the Baker's Dozen has a bunch of wonderful samples from this August's Release!! I am starting off by showing one fabulous stamp set called a Classy View, which coordinates with all of the previously released window dies. 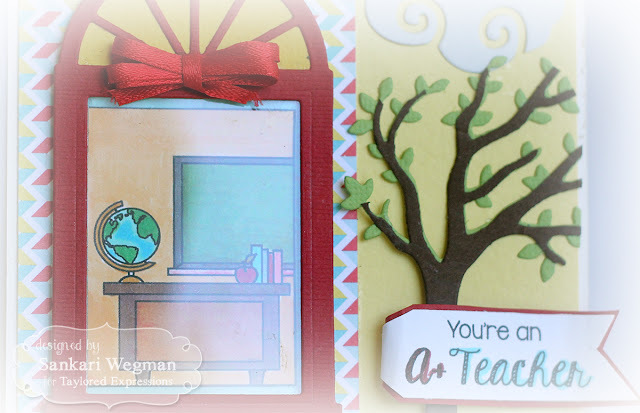 I used the Picture Window Die to frame the sweet image of the classroom that is in this stamp set - perfect to give to one of my children's teacher's as school starts up! I love the cute image of the teacher's desk with the globe! and I HAD to color in the board green because that reminds me of my childhood! These days - its usually a white board - maybe a blackboard - but in my school, we had green chalkboards and I loved being on eraser duty to slap the chalk out of the erasers! I loved creating a little scene and totally loved making a little scene with some super cute Mokas with the new to be released stamp set: Say What? This stamp set has so many cute bubbles with perfectly spaced sentiments that fit in them AND there are also coordinating Say What Conversation Bubble dies!!!! Say Whaaaat!!!! YUP! Dies that make it easy to create cute little speech bubbles! So for my card I thought it would be fun to have some Mokas show up at your door with some presents and cakes (yes, I said cakeS not cake!! :D) and presents for your birthday! I chose to stamp, color and cut Moka Madelyn, Moka Olivia and Moka Betty and arranged them together with bubbles on either side. Here is a close up of these cutie Mokas with the speech bubbles that I die cut and stamped with the Say What? stamp set! I Love all these Moka cuties!!! Please stop over tomorrow for release day FUN!!! OMG...your little scene is adorable, Sankari....what a genius idea to add the acetate to the window!!! 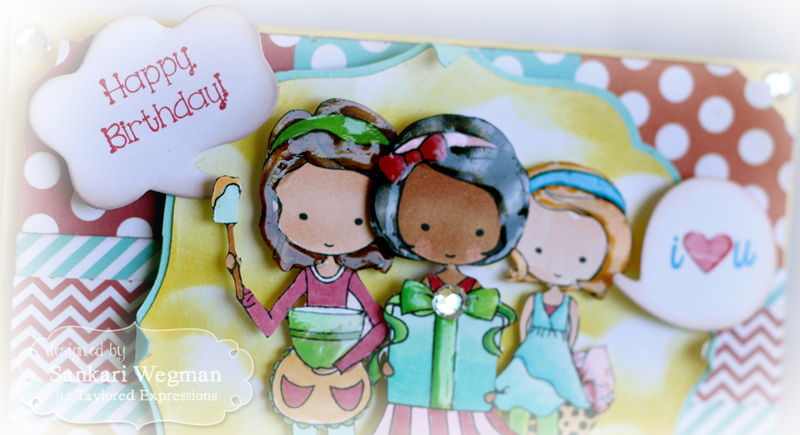 Your second card is super cute, too...what gorgeous coloring on those adorable little girls!!! SOOOO beautiful and inspiring! Love your Moka girls card - such a cute idea!! How sweet!!!! Amazing school house with beautiful tree - wow! Great curly sentiment! And all those Moka's - love your coloring and how you put them all into one scene! Your little trios of Mokas is killing me! Too too CUTE! !